Hello Everyone! My heart is so happy that I am finally getting back to blogging. Also, I am returning to the classroom as a 3rd grade teacher after being a librarian for 2 years. Yes, it was beyond awesome being a librarian...BUT...I am so excited about teaching 3rd grade again. My heart is in 3rd and I can't wait to meet my kiddos in August! Not only am I going back into the classroom, but I am also moving to a different school. SUPER EXCITED about that too!!!! I have always loved the theme of Peace, Love, and Happiness (can't you tell from my blog!!!). After much thought, I have decided to switch up my theme this coming school year. PINEAPPLES caught my eye!!! I literally can't stop searching Pinterest for pineapples!!! After hours and hours of looking for the perfect décor, I have finally found the right color combination that I absolutely LOVE and CANNOT live without!!!! 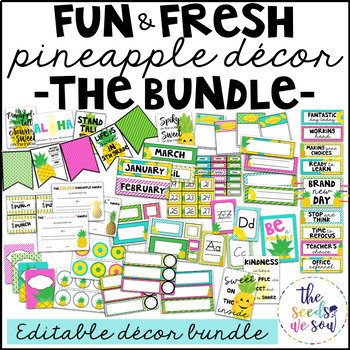 I am using Fun & Fresh Pineapple Decor from The Seeds We Sow. Stephanie from The Seeds We Sow is so sweet!! I asked her for the font she used and she was more than happy to help me!!! Aren't you in love with the bright colors??!! I already printed the calendar, clip chart, and posters. I also created my own Writer's Eye posters and objective labels. I can't wait to get in my classroom and start decorating! I know I am going to LOVE my room this year, thanks to Stephanie!!! I will keep in touch and let you know how my classroom turns out!!! Here are some things I plan on using in my room!! Upgrading my cart to bright colors! Thanks to my sweet husband! clips for my behavior chart from Michaels (AWESOME)! Visit Darleen's profile on Pinterest. Graphics by Jessica Sawyer and BlackLeaf Studios.